Yes, I told you so. I am gloating because I love to gloat. 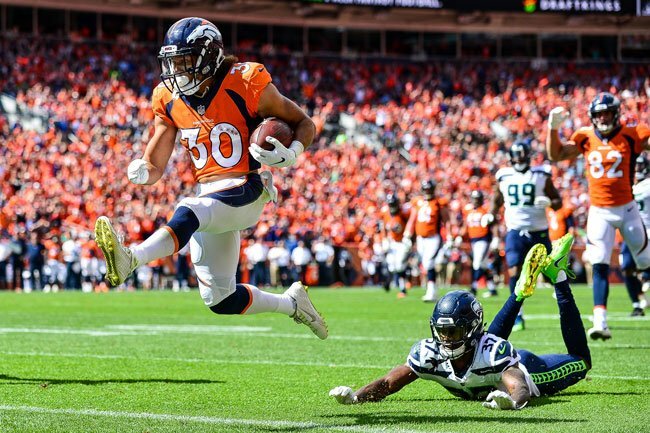 I told you, you would love new Broncos running back Phillip Lindsay. And the little undrafted free agent from Denver South High School and the University of Colorado Boulder went and scored the first touchdown of the season in a win over the Seahawks. I was right because I am paid to be right and I am always right. What you will notice about this touchdown is it was an actual football play. It wasn't a one-yard out dive play in which the offensive line did all the actual work. He caught the ball around the 30-yard-line and turned on the afterburners and left everybody on the field. He did get a nice downfield block from DaeSean Hamilton, but Lindsay did a lot on that play. It was a beautiful moment, the type of which does not happen all that often in sports these days, which is to say it happened naturally, organically, without a public relations professional behind the scenes pulling the strings. No NFL coach is going to put someone on the field just because he's a hometown hero, at least not if that coach wants to keep his job. Even though Vance Johnson is also an alumnus of the University of Colorado Boulder, Lindsay earned this himself. Lindsay finished with 10 receptions for 31 yards as well as a touchdown and 15 carries for 71 yards, which means any Colorado Buffaloes fans who picked Lindsay up in their fantasy leagues for sentimental purposes was pleasantly surprised. I am not even a Broncos fan, but I would defend Phillip Lindsay with my life. Did you catch the game on Sunday? What did you think of Lindsay's performance? Let us know in the comments below. Is this the year that Pat Bowlen (finally) gets inducted into the Hall of Fame?